The Waterloo Fire Department responded at 12:45 p.m. Thursday to a fire at Gateway FS’s Waterloo fertilizer plant at 829 Gall Road. 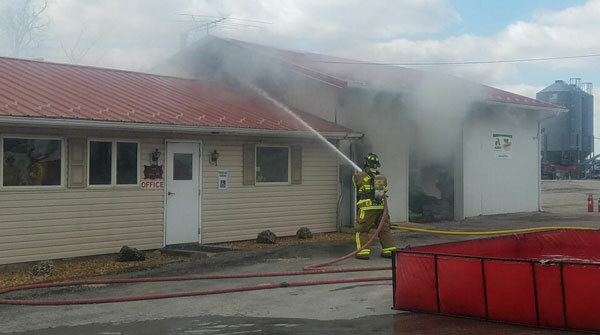 The fire occurred in a building that was part office and partially a seed storage area, Waterloo Fire Chief Aaron Shive said. The fire originated in the ceiling area and was possibly electrical in nature. The cause of the fire was not yet known, however. “There were no chemicals in the building,” Shive said. The Columbia Fire Department provided a tanker with additional water. Monroe County EMS, Waterloo Police Department and the Monroe County Sheriff’s Department also responded to the scene. A Gateway FS employee was inside the structure when the fire occurred, Shive said. He used a fire extinguisher in an attempt to knock down the flames but quickly evacuated when that was unsuccessful. Firefighters were able to knock down the flames within a short amount of time. No injuries were reported.